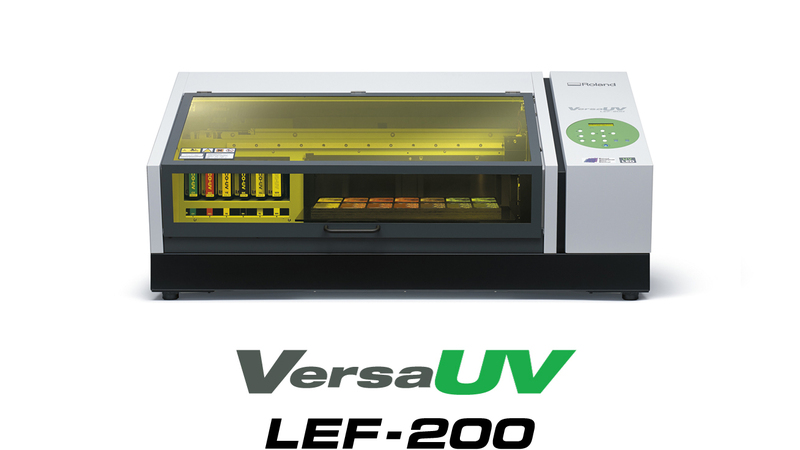 Roland DG Corporation, a leading manufacturer of wide-format inkjet printers worldwide, today announced the addition of the VersaUV LEF-200 to its lineup of benchtop UV-LED flatbed inkjet printers. According to Hirotoshi Naruse, product manager of Roland DG’s digital printing business, the LEF-200 was developed to offer outstanding print quality, greater media compatibility, and ease of use for the personalization and custom printing markets, which are characterized by small-lot production of numerous products. At 20 inches wide, the LEF-200 prints high-quality full-color, white, clear and primer inks on a wide variety of materials including three-dimensional items up to 100 mm thick. To accommodate an expanded range of profitable applications, the LEF-200 features a new on-board primer ink option for priming objects quickly and conveniently. The new Roland VersaWorks Dual RIP software simplifies the process of producing graphics with special effects. “With the LEF-200,” Naruse said, “you can print rich color directly onto a wide range of personalized consumer products and promotional items such as smartphone cases, pens, awards, giftware, plates and more.” The new primer ink option allows users to prep an object for customization before printing a full-color graphic. “This makes adding graphics to glass, plastics and other challenging media* so much more clean and efficient,” he said. The primer ink option is also compatible with the LEF-300. The LEF-200 incorporates Roland DG’s proprietary CMYK, white and clear ECO-UV inks for premium quality printing. Clear ink can be printed for spot gloss or matte finishes, as well as unique embossing effects. White ink can be printed as a spot color or as a flood behind CMYK on dark backgrounds or clear materials. To meet individual business requirements, users can choose from three ink configurations: CMYK+White+Primer, CMYK+White+Clear, and CMYK+White+White. “We also added usability enhancements to the LEF-200 for greater efficiency.” Naruse added. Roland VersaWorks Dual enables users to work not only with PostScript® files, but also allows for native processing of PDF files to ensure transparency effects are processed accurately. In addition, white or clear ink data can be generated easily in the RIP, ideal for use in producing transparent personalized accessories with special effects. The position and size of special color data can also be adjusted in the RIP for perfect registration. Features like rotation and mirroring of the data can be configured in the RIP as well, without the need to return to your graphic design software. The newly available Maintained Clipped Position function is included which enables you to print designated images only. This feature is useful when extra processes such as clear effects are required for printing specific items.